Update July 6, 2015: The 'NO' vote has won, 62%: 38%!The 11:00PM ABC news last night reported large rallies for a 'No' vote at today's referendum in Greece. Rallies in Greece in support of a 'Yes' vote were considerably smaller. Rallies by Greek Australians also featured in the report. 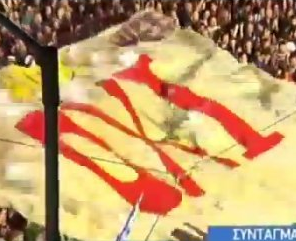 In spite of the fact that further austerity and privatisation that could only be ended with a 'No' vote, would be disastrous for the Greek people, the organisers of the Australian rallies chose not to advocate 'No' vote. Instead, the rallies are taking a neutral stance ostensibly in solidarity with Greece. Reports of rallies in Australia and Greece can be found on the ABC News site. 1 Included below, in this article, are two embedded videos of rallies of Greeks in support of a 'No' vote against the IMF bailout conditions. Both were uploaded on 3 July 2015. The first, from the RT YouTube channel, is of length 3:28 minutes. (The fact that this video is only in Greek and has no English sub-titles does little to detract from its value for English audiences.) The second, from ThePressProject video channel is of length 10:30 minutes. It has been dubbed over by an English interpreter. Previously published (2/7/15) by Paul Craig Roberts. Updates, 4 Jul 2015: Tsipras calls for 'No' vote in referendum on creditors’ demands | PressTV, 'No more looting': Thousands rally across EU to express solidarity with Greece | RT, 'No' and 'Yes' bailout referendum rallies gather thousands in Athens | RT, Greece – Risk of False-flagging Greece into Submission and Chaos? by Peter Koenig | Global Research, Could Greek resistance bring down the EU? (1/7/15) by Prof. John Quiggin | ABC The Drum, Greece and Other Musings On July 4th by Paul Craig Roberts, Greek Press Accused of Spinning Preliminary Poll Results as Yes Vote | Sputnik News. James Galbraith, a professor at the University of Texas, explains what is at stake this Sunday. This is an important article. Because of the presstitute Western press, Americans, Europeans, Canadians, and Australians have no comprehension that their own liberty, or what little remains of it, is dependent on this vote. If the Greek people accept the conditions given to them in the ultimatum from the IMF, European Union, and European Central Bank, an ultimatum supported by Washington, the precedent will be established that the greed of the One Percent prevails over the sovereignty of peoples. There is a massive Western propaganda campaign to make Greeks fearful and to use this fear to manipulate a Greek vote against their own government and in favor of the Global One Percent. Previously published (27/6/15) on PressTV as Tsipras calls for referendum on creditors' bailout demands.This article also includes embedded video Greece to hold nationwide referendum on the country's future on July 5. See also , That which you were never told about Greece (23/2/15) by Aléxis Tsípras | Voltaire, Greece to hold national referendum on debt deal - PM (27/6/15 - with video) | RT and other alternate and mainstream reports. People in Greece will vote in a referendum on whether their government should agree to international creditors' demands in return for a bailout to the debt-ridden country, Greek Prime Minister Alexis Tsipras says. 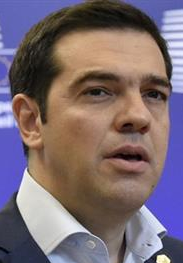 The plebiscite will be held on July 5, Tsipras said in a televised speech early on Saturday, adding that he had already informed Greek President Prokopis Pavlopoulos and the largest opposition party, the conservative New Democracy party, about the plan. In this episode of the Keiser Report, Max Keiser and Stacy Herbert discuss the impossible demand from the Greek voters that both austerity ends and that they remain in the euro as currently arranged. They also look at a parallel “future-tax” crypto currency as a possible answer to Greece’s problems. In the second half, Max interviews Liam Halligan, editor-at-large at BNE.eu and columnist at the Telegraph, about the latest on the unpayable debt crisis in Greece. Liam suggests a Grexit will happen but that Greece won’t be the first European nation to leave the euro.